It became very fashionable for gentlemen and young boys to wear very stiffly starched collars, so hard that they were like cardboard. Those that could not afford to buy specialist starches like Glenfield’s, boiled vegetables that were high in carbohydrates like potatoes. 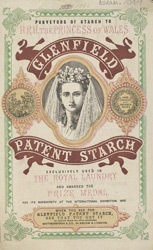 There were many specialist starches for sale in the 19th century and to ensure that Glenfield’s stood out they used the Royal Family to advertise their product. This advert implies that HRH The Princess Of Wales used Glenfield’s starch for her wedding dress.